The private Dream Chaser space plane built by Sierra Nevada Corp. is seen landing with its left landing gear not deployed properly in this still from an Oct. 26, 2013 unmanned drop test at Edwards Air Force Base in California. The gear malfunction caused the prototype to skid off the runway. A private spaceflight company is investigating the glitch that caused its space plane — designed to eventually carry astronauts to and from orbit — to skid off the runway during an unmanned test. On Saturday (Oct. 26), Sierra Nevada Corporation's Dream Chaser was carried by helicopter up to 12,500 feet (3,810 meters) and then dropped in what was its first-ever free flight test for the space plane. The drop test gathered key data during the flight, but upon landing the vehicle's left wheel failed to deploy properly. "The entire interior of the vehicle, the pressure vessel as we call it — the crew compartment — is completely untouched by the incident," Mark Sirangelo, corporate vice president and head of Sierra Nevada Corporation's Space Systems based in Louisville, Colo., told members of the press today (Oct. 29) during a news conference. Sierra Nevada officials released a video of the landing malfunction; however, the video cuts off before the spacecraft touches down on the runway. "All systems are fully operational, there is no damage to any of the critical components of the vehicle. All the flight computers continue to work," Sirangelo added. "They are still working, there is no damage to any of the sensitive parts of the vehicle." Sierra Nevada Corp.'s Dream Chaser space plane prototype soars down to Earth with mountains as a backdrop in this still from an Oct. 26, 2013 drop test at Edwards Air Force Base in California. All of the space plane's parts are still attached to the vehicle despite its bumpy landing, which could aid in the malfunction investigation, Sirangelo said. 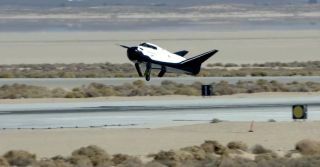 While the space plane's computers functioned, sending commands to the landing gear, the left side wheel failed to deploy properly, Sirangelo said. The landing glitch seems to have been caused by a gear malfunction, Sirangelo said. The gear itself is a "heritage" part from a fighter jet that Sierra Nevada used for the test vehicle, but the company does not plan on using the adapted gear for the crew-carrying Dream Chaser. The vehicle can be repaired, but the prototype that flew on Saturday is designed to conduct only two automated flights. Because of the wealth of data collected during the first flight, it's possible that Sierra Nevada officials won't need to fly the prototype again before taking it back to Colorado. "If we got all the data that we needed to get — and it's still early, they're still assessing that — but if we were able to get all the flight data we were expecting to get, we might actually be able to bring the vehicle back earlier to get it ready for its next flight, and in some strange way, that might actually accelerate the data and accelerate the program," Sirangelo said. "We don't think there is going to be any significant delay to the program." This still image from a Sierra Nevada Corp. video shows the Dream Chaser space plane on approach to landing during an unmanned drop test flight at Edwards Air Force Base in California on Oct. 26, 2013. The Dream Chaser looks like a miniature space shuttle and is being developed to ferry astronauts to and from the International Space Station and other low-Earth orbit destinations. It is built to carry seven passengers and is about 29.5 feet (9 m) long and has a wingspan of 22.9 feet (7 m). Sierra Nevada and two other spaceflight firms receive funding from NASA's commercial crew program. The program is designed to help replace the space agency's shuttle program, which ended in 2011. Dream Chaser is the only reusable, winged spacecraft in development as part of the program, with Boeing and SpaceX designing capsules. This test marks a milestone for the Dream Chaser. As part of the contract with NASA, the space agency will review the flight to evaluate the data collected during the test. If it is sufficient, NASA will award Sierra Nevada an $8 million payment. Sierra Nevada officials expect to fly their first orbital unmanned demonstration mission with Dream Chaser in 2016. The crewed demonstration is expected to occur the next year.